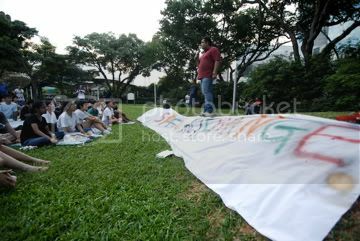 Students from Raffles Institution speaks up on social issues at Hong Lim Park event. Jewel Philemon. ‘Is health-care and sanitation a basic right?’ A Special Interest Group (SIG) from the Raffles Community Leadership Forum (RCLF) seem to think that these basic human rights are denied to the physically disabled. The students, who gathered at Speakers’ Corner today, were there to create awareness about the plight of the disadvantaged and disabled in Singapore. Ten SIG who were concerned about issues ranging from intellectual disability to urban poverty, from youths at risk to environmentalism, and from animal welfare to dating violence, gathered at Hong Lim park on an extremely hot Sunday afternoon to. 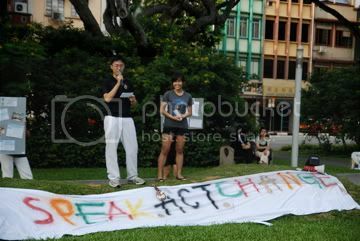 The title of their event was, “Speak, Act and Change”. It is a prelude to the RCLF which will be held in June of this year. In illustrating this, Santoshi’s SIG, which advocated for the rights of the intellectually disabled, spoke about society’s misconception about the intellectually disabled. The public’s false ideas may have come from the fact that the intellectually disabled have received minimum education. Currently, her team said, the unemployment rate for the intellectually disabled stands at a whopping 72%. 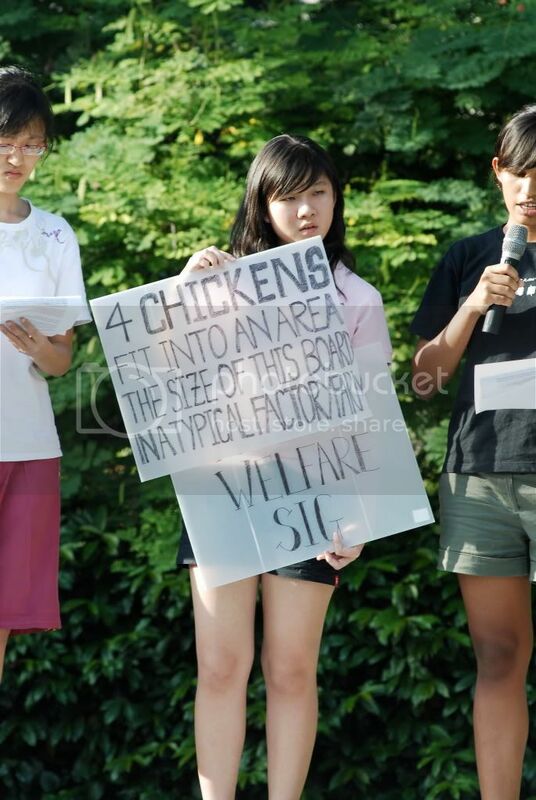 The topic then turned to chickens when the SIG for animal welfare took to the stage. They spoke up against ‘Farm Factories’, the mistreatment and cruelty meted out to these voiceless farm animals. The SIG claimed that movies like ‘Babe’ and ‘Charlotte’s Web’ glossed over the reality of cruelty meted out to farm animals. “He said cruel things to me but I know he loves me, because he sent me flowers today.He hit me but I know he loves me because he sent me flowers today.” The narration by two members of the SIG group advocating against dating violence related an example of how sending flowers after an escalation of violence seemed to make matters better for one girl. But the narration ended with, “Today is a special day. It is my funeral. He finally killed me. He sent me flowers today.” Through the imaginative skit and the accompanying speech, they asked those that are going through dating violence to call the available hotlines, counselling services and women’s shelters. Mr. Gene Kam, the person in-charge of all the SIGs, made an impromptu call to Mr. Ravi Philemon, a community worker, to share and summarise the event, saying that the youths of today need role-models and some people to look up to. Mr. Philemon said that speaking is difficult but that if you really believed, you need to speak, that acting is much more difficult than speaking but that we all must “walk the talk”, and he said that when one walks the talk, change will come. He asked the student advocates to persevere even if change seems slow in coming. 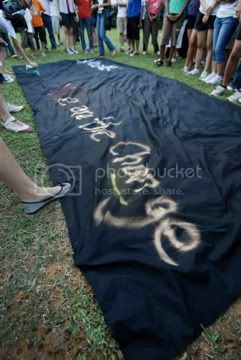 As a final act of demonstrating and creating awareness the Raffles Community Leaders and the SIGs spray-painted their concerns and advocacy on a black canvass. As they were doing this, Vidhya, Linli and Sihui, all 17, said that the government would surely respond to their earnest pleas, but more importantly “it will influence future government decisions”. Jewel Philemon is a home-schooled 16 year old student, who aspires to be a journalist.